The Q8 refinery is located in Europoort the port of Rotterdam, which is the biggest port in the world. Q8 is the brand name of Kuwait Oil International doing world wide operations outside Kuwait. The crude oil used for refining is comes from Kuwait, the refinery produces mainly fuel and lubricants, as well as raw material for the petrochemical industries. In refineries water is used for a lot of processes. Mainly the water is used for heating or cooling the crude oil or hydro carbons. As usual in the effluent water there are many different foreign substances, such as blow down from the steam boilers and cooling towers, rinse water and traces of hydro carbons. environmental requirements of Q8 the effluent water is going through a row of cleaning and purification processes. At the end of this process the water which flows into the public sewage system is cleaned and controlled by Europoort regularly. In this picture you can see one of the pipes connecting two process units. At the inside of the pipe walls a lot of limescale settled over the time. This reduced the pipe diameter and lowered the flow rate. Therefore problems occurred upstream. 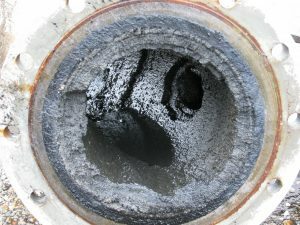 As often pumps are responsible for these problems they were checked at first. But even after cleaning them carefully the flow rate didn’t increase. Finally the customer checked the pipes and took the first picture to record the situation. As the pipeline’s length is only a few hundreds meters. That is why we decided to install one Merus Ring at the beginning and a second one directly after the pump. This ensures the same effect on the water after the pump even if it emits electrical fields. In this case before and after the installation of the Merus Rings no chemicals were added. To achieve an effect with them the customer needed to determine which substances are solved in the water – this was not possible. This means that nothing in the system was changed apart from treating the water with Merus Rings. the water treatment is to open the pipe again. To compare the results the same picture as before was taken 6 months after the installation. Compared to the first picture where the layer of deposits has been about 50mm thick, the second picture shows a significant improvement. The calcium layer at the pipe walls is now far thinner, about 25mm. 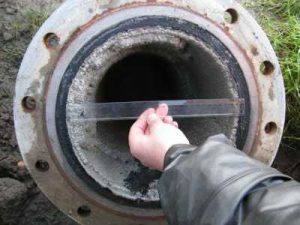 Around the pipe the thickness of the layer varies because the flow rate is not the same in all areas. 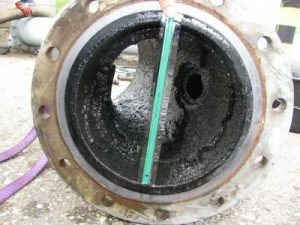 Where the flow rate is low it can take more time to remove existing deposits. as been taken one year after the installation. Here you can see that there is only few deposit left. Some areas are completely free of limescale. The reduction of deposits was slower in the second half of the year compared to the first half. The reason for this is the reduced flow speed. When the inner diameter of the pipe increases (in total 70mm) the flow speed and friction of water and pipe wall decreases. Therefore the erosion of the crust takes more time. In this case it might take one more year until the pipe is completely clean. But the goal is to stop new forming of deposits and stabilize the flow rate. This means the installation has been successful.